It took hours just to code the HTML, so please don't laugh at typos (but do let me know). 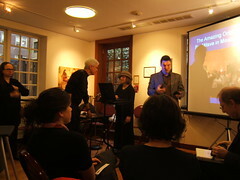 There was a wonderful Yiddish Dance Symposium in NYC, at NYU, back on December 9. It was followed the next day by a "planning meeting" for the academics, teachers, and others who want to ensure that this tradition is better recorded and especially, taught. My notes are online now. Enjoy!